Chanteur Rock 'n' Roll US, Bobby Paige a enregistré chez Renor Records de Jacksonville (Floride). US Rock 'n' Roll singer, Bobby Paige recorded at Renor Records of Jacksonville (Florida). 19?? 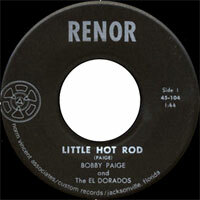 SP Renor 45-104 (US) Bobby Paige & The El Dorados - Little Hot Rod / ?